IST has been supplying process plants, equipment and piping systems in stainless steel since 1975. IST provides its clients with comprehensive, innovative and tailor-made products and system-based solutions. The professional processing of stainless steel has been a part of its core business for more than 40 years. Based on years of experience, competent expertise and innovative ideas, IST offers the first totally integrated system for the supply of 400 Hz power and pre-conditioned air (PCA Units) to aircrafts on ground: the Aircraft Ground Energy System AGES. Thanks to the availability of this system, the Aircraft Power Unit, with its poor efficiency of between 8-14%, remains off. the CO2 and NOx emissions produced by Aircraft Power Units operation can be reduced by around 90% (Airport Zurich: -65’000 tons of COs and 173 tons of NOx per year). “Swiss Made” stands for top quality, precision, reliability and exclusivity. Since 1975 IST has committed itself to bringing this concept to the market through the production of its high quality systems. 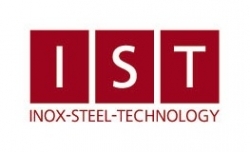 In order to ensure that Swiss standards of quality are met in every sense, IST‘s products are exclusively produced by its qualified staff at its location in Switzerland. With AGES, IST–Edelstahl-Anlagenbau AG (IST) offers the first complete system for the power (400 Hz) and pre-conditioned air (PCA) needs of aircrafts on ground. 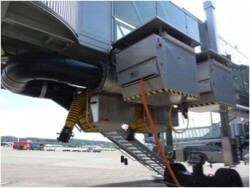 Thanks to the availability of this system, the APU, with its poor efficiency of between 8-14%, remains off. Typical fuel savings of up to 90% can be achieved when compared to the fuel used by the APU. The emissions of CO2 and other pollutants are reduced respectively by 90% while the ramp noise level drops considerably. Rising fuel prices and a greater need to protect the environment demand a greater awareness and fundamental review of energy efficiency. The implementation of AGES allows airports to invest in the future as well as the environment. By implementing AGES as a complete system under one contractor, interfaces are reduced and the entire coordination is passed onto IST. The POU air conditioning unit developed and supplied in cooperation with Seven-Air is a complete, self-contained unit that ensures the effective cooling, heating and airflow to all types of aircraft while on the ground. Extremely high pressure and temperature differences place high demands on such equipment. To suit the air conditioning requirements of all aircraft types, three different units are available. 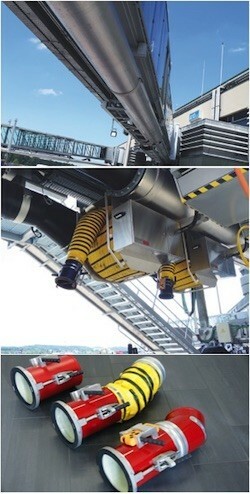 These are specifically designed to meet local climatic conditions and individual needs of the airport. All POU’s are individually equipped with dedicated process controls. Chiller plants provide the needed cold and warm water from a central location and then send it via a circularly routed distribution system to compact air handling units (AHUs) located at the passenger bridges where the conditioned air is then produced. 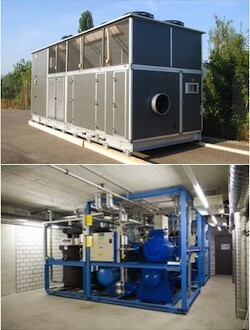 The easy-maintenance Air Handling Unit concept is suitable for perfect, hygienic operation. Large inspection doors as well as completely smooth inside surfaces and consistent adaptation of the casing and the installed components facilitate the maintenance work. The IST-manufactured and initially patented telescopic tube is the only PCA tube worldwide that consistently demonstrates a well above average service life. Manufactured entirely in stainless steel, it is extremely stable, robust and basically maintenance free. The exceptionally smooth surfaces and unique insulation keep pressure and temperature losses to a minimum. The special construction with flexible outside and inside bearings guarantees a proper adaption of the telescopic tube to axial and lateral movements of the boarding bridge. The gasket designed by IST withstands temperature fluctuations from -40°C to +80°C and is absolutely wear resistant. 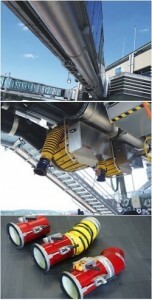 The IST provided hose reel replaces the manual winding and unwinding of the PCA hoses. Through the use of a remote control device located at the connection to the aircraft, the reel can be operated easily and safely by one person, thus minimizing wear to the air hose and the aircraft coupling. Siemens provided control allow the operator to program in line with his individual needs. The use of high quality materials ensures minimal maintenance costs, guarantees optimal function and a lifecycle of more than 20 years. 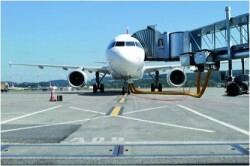 IST has developed an innovative aircraft coupling, which allows easy docking of the PCA air hose to the aircraft. The coupling is manufactured in fiberglass and thus very robust and has a well above-average service life. In order to guarantee proper airflow, the coupling is fitted with a gasket so that the air hose is tightly docked to the aircraft. A spring activated pressure mechanism ensures that the different thicknesses of the aircraft flanges are automatically compensated in order to form a seal with the aircraft. A stainless steel flange protects the gasket against wear and abrasion. 400Hz generators provide uninterrupted power supply to the aircraft on the ground prior to safe shut down of its engines after docking. Suspension systems, specifically designed by IST, can easily accommodate the 400Hz cable and hose reels under the bridge without affecting its operational capability. In order to guarantee that the airport receives the best possible system on the market, IST employs the same standards of quality in the selection of subcontractors for the 400 Hz systems as it does for its own products. Quality: Stainless steel components are easy to clean, virtually maintenance free and durable. Safety: Stainless steel is strong, corrosion resistant, wear resistant and resilient. Design: Stainless steel is aesthetically pleasing. Environment: Stainless steel has a better energy and resource use balance and is 100% recyclable. Costs: Technically and economically, stainless steel is probably the best solution. By implementing AGES, we guarantee the highest quality PCA system with lowest temperature and pressure losses and the best performance in the market with an availability of the complete PCA system of 99.96% proved by the airports.